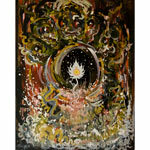 A white lotus with a yellow pistil stands high in the center of the painting. 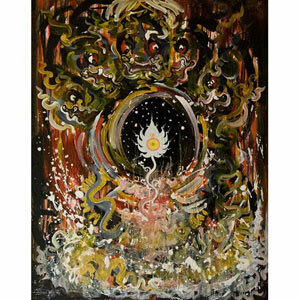 A white lotus flower refers to total purity of the mind and spiritual perfection. It rises from the chaotic expanse where snakes and evil lurk. Its blooming purity opens a round window on the universe, where stars twinkle in the distance. Envying its purity and beauty, giant demons stare at the bloom from above. 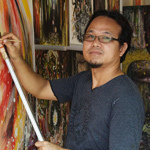 Using acrylics, artist Pairote Sitthikaew signed and painted this piece in 2012.